Insider Series: How Are Flight Attendants Paid? Following Delta’s announcement that it’ll be giving most of its front-line and lower-tier management staff an across-the-board raise of 14.5%, TPG Insider Carrie A. Trey thought now would be a good time to discuss exactly what it is your airline crew are paid for — and how they’re paid, as well. Editor’s Note: Please remember that in her Insider Series posts, Ms. Trey is sharing her personal opinions, observations and experiences, and these don’t necessarily reflect the opinions of the TPG Team. With that disclaimer out of the way, please enjoy this latest installment from Carrie. In the wake of Delta Air Lines’ post-9/11 bankruptcy, the carrier’s flight attendants found their pay cut by 40%; the attendants were unsure if this would be a permanent situation, but hoped they could trust management’s assertions that it was temporary. Since then, Delta flight attendants have received a few raises, but with the announcement of a December 1, 2015 raise of 14.5% for many of its staff, Delta flight attendants’ pay will finally rise above pre-bankruptcy rates. Bravo, Delta! 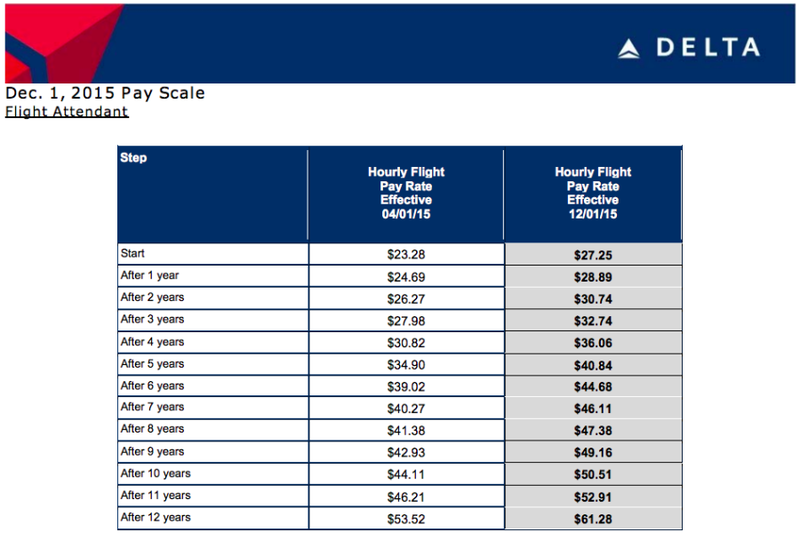 Delta’s new hourly pay scale effective 12/1/15 compared to the current pay scale. Hourly — This is the system used by the three major US carriers — Delta, United and American — as well as a several other airlines. Flight attendants’ hourly rates are generally calculated from the time the aircraft door closes until the time it’s reopened (often called “block time”). Therefore, all time spent in the terminal prior to the flight, time spent getting the aircraft ready, doing security and safety checks and, of course, boarding and deplaning is all unpaid. Most airlines pay their crews if the door is still open and there’s an extended delay, but it’s nowhere near what crews are paid once the door is closed. The average hourly base rate paid to a flight attendant with a major airline is about $25-30, and depends solely on his/her years of service with the company. A top hourly rate is roughly $55-60 an hour, and can take as few as 13 years to reach (as is the case with Delta) or as long as 20 years (as in the case of Hawaiian Airlines). 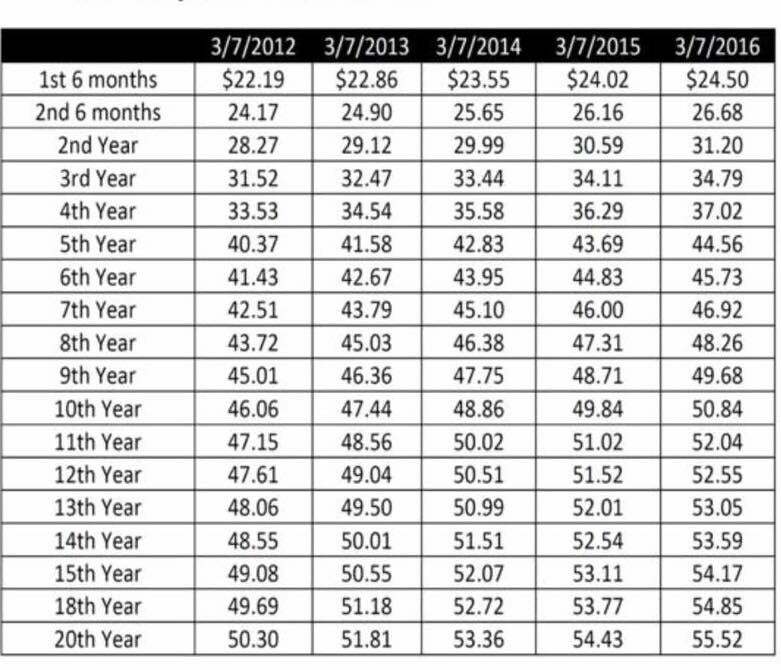 Hawaiian Airlines’ pay scale for flight attendants, where it takes a whopping twenty years to reach the top. Trips For Pay (TFP) — Alaska and Southwest use this much more complex payment method, which is based on a combination of miles flown and block time. A flight attendant earns 1.0 TFP for any flight that is 243 miles or less from origin to destination (based on a standardized government publication of airport distances). For flights that are longer than 243 miles, an additional 0.1 TFP is earned per 40 extra miles flown, rounded to the nearest 40. Additional TFPs are also accrued if unusual delays away from the gate occur; this includes things such as extended taxi/de-ice time, ATC holds and longer flight duration due to weather. Southwest’s current pay scale, with each step representing the rate per TFP. Base salary — Some airlines (Lufthansa and Emirates, for example) have a base salary of roughly $2,000 per month, and this base salary, like the hourly rates above, will vary depending on how long the crew member has been with the company, whether or not they’re a purser, etc. Median salaries at major American carriers hover around $40,000 and max out at roughly $70,000, while at budget airlines like Spirit and Allegiant, salary-earning potential maxes out at about $40,000. Straight monthly salary — With this system, which is used mostly in Europe (by KLM and SAS, among others), crews are given a fairly generous monthly salary, usually tied to how much a given crew member flies. A full-time (or 100%) crew member might be scheduled for 80-90 flying hours per month, while someone who flies at 50% (and thus only receives half of the salary) would be scheduled 40-45 hours a month. 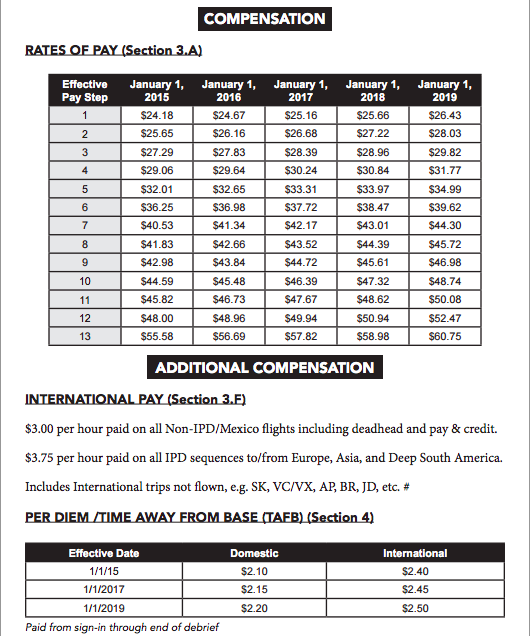 American’s current pay scale, including information about premium pay and per diem. Hourly. Some airlines have an hourly per diem rate that is calculated from the time the aircraft door closes in a flight attendant’s base city until the door is opened again when they return to that city. For example, on a trip to Europe with a 24-hour layover, this time is often just around 48 hours. The per diem rates tend to be in the $2.50/hour range, and the amount is paid out with the flight attendant’s regular paycheck. So an average trip to Europe with a 24-hour layover would earn a flight attendant $120 — plenty of cash to get him or her through the stay. Cash in hand/charge card. This cash amount is calculated based on the average cost of living/incidentals in that city, the length of the stay and how many meals the crew member is likely to have during that stay. For example, a flight attendant will receive a larger per diem for a 24-hour layover in expensive New York City than one of the same length in far cheaper Colombo, Sri Lanka. Middle Eastern airlines like Emirates and Etihad still do things the old-fashioned way — crew are given cash on arrival at the hotel in their layover city to cover their expenses during their stay. European airlines like KLM and Lufthansa, however, deposit this amount on a charge card that’s given to the crew member, who can then decide to use it as a traditional charge card, exchange it for cash or simply keep it for future use. Extra pay — Lastly, there are a variety of additional amounts that can be added onto a flight attendant’s paycheck, but these are provided almost exclusively by airlines that pay by the hour. For example, crew members who speak another language get additional hourly pay on flights where that language would be of use; the purser’s hourly premium is almost always higher than that of other crew members; and some crew members are paid extra just for working red-eye flights. For some cabin crew, these extra amounts can mean the difference between being able to work full-time as a flight attendant or having to secure another job — so it pays to be (at least) bilingual, dedicated and flexible!